Last weekend was a total blur. Actually, the whole week was kind of like that. A big project popped up at work, and a friend decided that it was high time to tie the knot, and then there was the matter of the dye workshop I’d been planning to do with Mistress Dominica and other SCA folks. The dye workshop was for all kinds of dyes – indigo, osage orange, turmeric, madder, cochineal, and a failed attempt at dandelion root purple (keep trying, B, you’ll get it!). 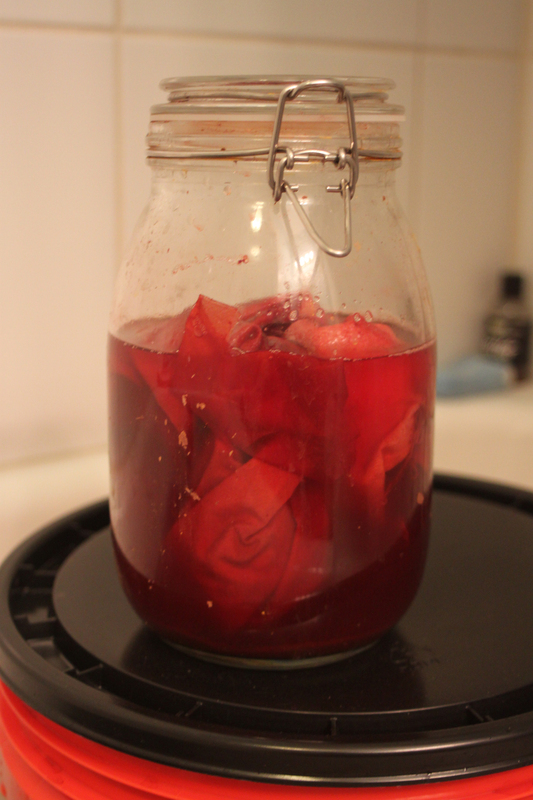 I dabbled with indigo, turmeric and a little of the cochineal. My focus, though, was the madder. As with all the things I research in the SCA, my interest in dyes centers on India and more specifically block-printed textiles. Many of them are red and blue, the red applied as a madder stamp and the blue an indigo dyed with the use of a wax resist. I will eventually do the second thing, but it’s not a process I’m familiar with. So I thought, hey, madder, that’s like things I know how to do already. I know printing! 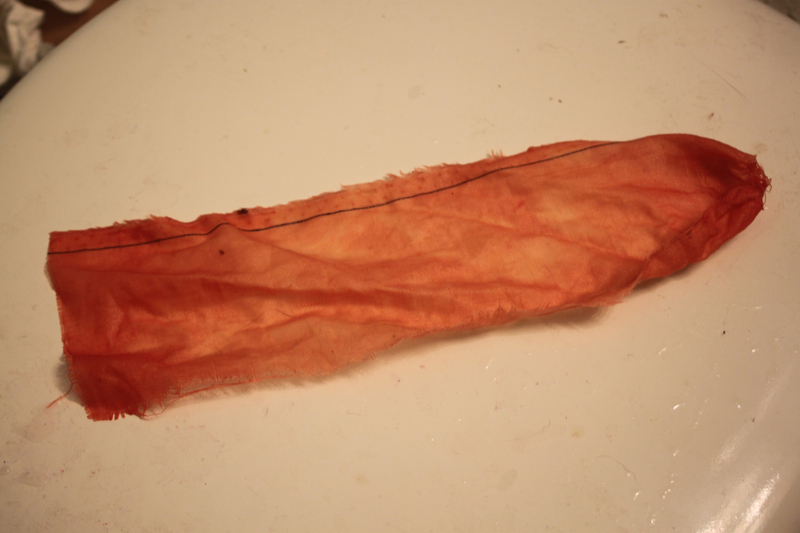 I know fabric dye! This should be simple, right? Oh, yeah. Did I realize that madder is one of the most difficult reds? You can get a great pink, or a lovely beige, or a peachy orange, but red? Red is something that medieval europeans paid a lot of money to import before they learned the process. 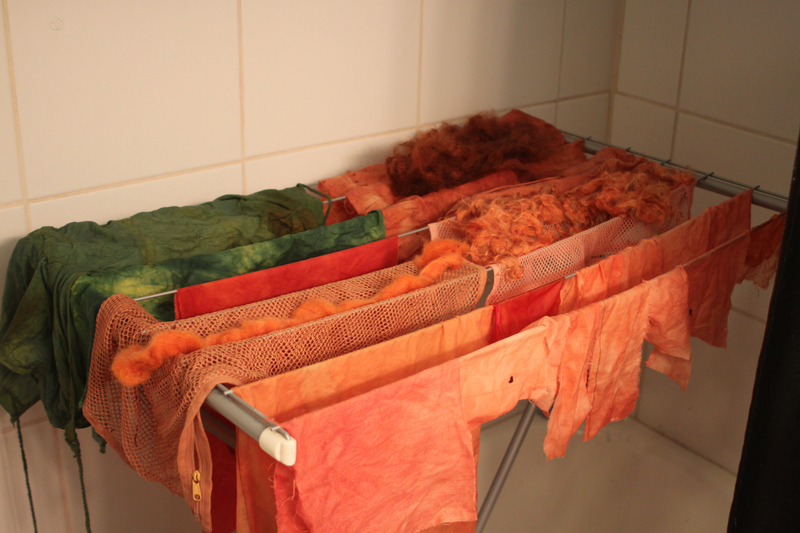 Which, I’d like to point out, is a multi-day, multi-step process involving a lot of very delicate temperature regulation and many different fabric treatments before you even get to the dye portion. Actually, on the other hand, I knew this and it made it not so frustrating when I tried to stamp the fabric with a mordant (actually, Dominica did this) and the fabric did not change colors at all. This continues to be a puzzle to solve (according to multiple sources, this is something that was done in period). We stamped with a little bit of madder paste mixed into some water, and that seemed to work better, but it was very pale. Clearly there’s something else I need to do with this, but I don’t know what yet. 1. Used ~2 lbs of loose root pieces, steeped in two gallons of water for three steepings. Steep 1 yielded a brownish sort of tan. Nothing terribly exciting, but not plain fabric. Steep 2 yielded a peachy pink, which was one of the shades Dominica and Ophelia had gotten in their previous experiments. I tried a third cold steep, which is still sitting in its bucket. It didn’t make any deeper red than the second steep, but that was only after two hours in the vat. I ran the wet pieces through a blender to break them up a bit, and then put half back in the bucket with fresh water (that’s the vat that’s still soaking) and half into a big pot to heat slowly. I used the directions in the Gryphon Dyeworks booklet, which said to head the alkanet pot to 150-175 degrees for 60-90 minutes, which involved turning on the stove, and then turning it off again, on and off for the whole 90 minutes. After it was done cooking, I poured the contents into a bucket to cool, and immersed sample fibers in the bucket. 2. Water and pre-prepared madder powder, which is basically the same as what I did, except that the cooking and straining and grinding steps have all been done in advance. I put the water and madder into a quart-sized baletop jar, and put several samples into the liquid. While the madder was doing its soupy cooking, I triple-mordanted a piece of cotton, and single-alum-mordanted another piece of cotton and a piece of silk. For the fancy multiple mordant process, I did one bath in alum and soda ash, then one in tannin (in the form of very, very stiffly brewed tea), and another in the soda ash. 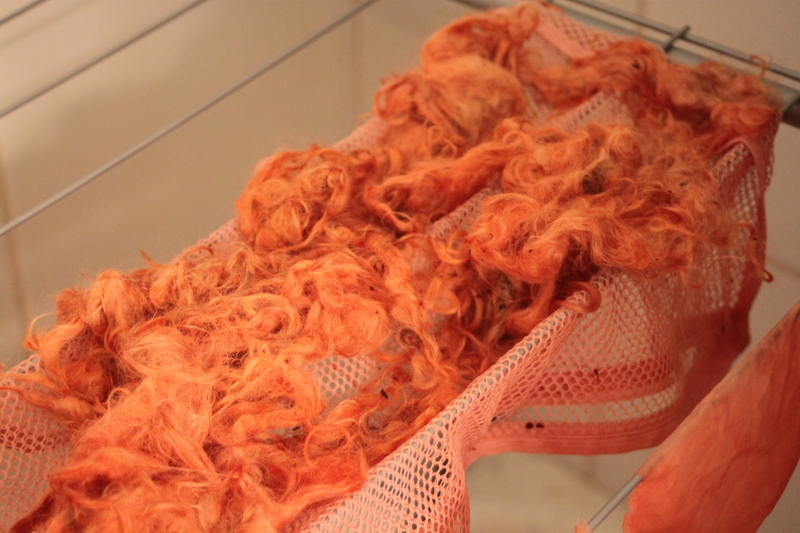 After it dried, I cut strips off to put into my vats to test. 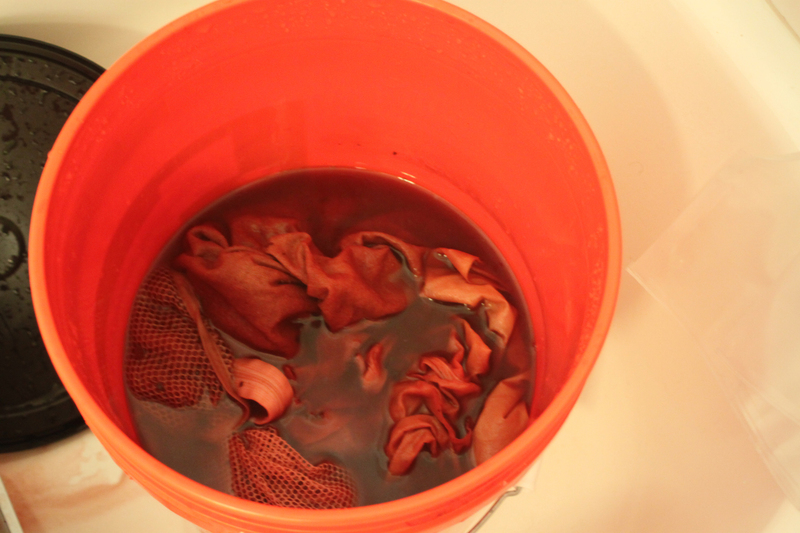 The Grypon book also said to let the fibers soak in the dye bath for 2-3 days to achieve the best red, so I left the buckets/jars sitting in my house until this evening, and then pulled them out. I don’t know how to get a deep red with a stamp, since I’m not sure how you’d let the dye get a good soak with a single application of the dyestuffs. Maybe you let it sit on the fabric and then wash it a few days later? I’ll have to experiment. 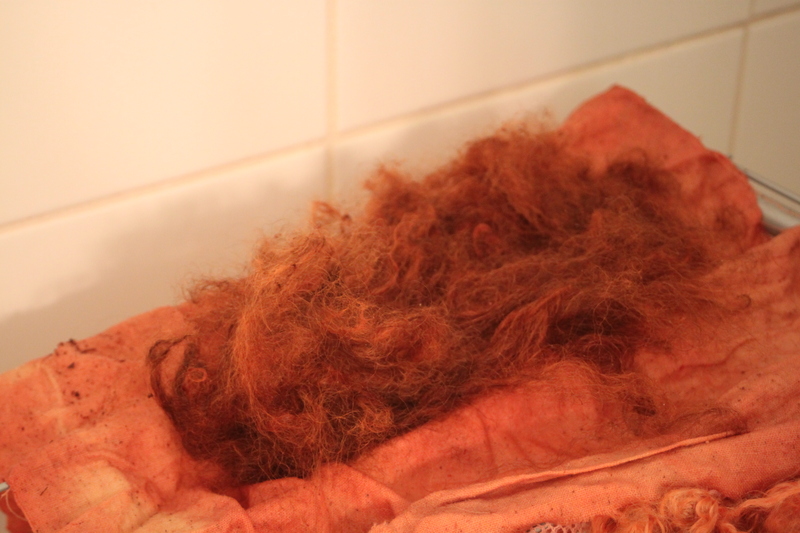 I do know this – what I did with the madder root pieces did not give me the desired result, except partially with wool. Yep. That’s a Home Depot bucket. They come with sealing lids! Kinda perfect, as long as you don’t put something too terribly corrosive inside. You can see a tiny spot in the middle where the madder bits got stuck to the fabric while it was cooking, and left a very deep red. The rest is a sort of brownish orange. Not bad, but not what I was hoping for. 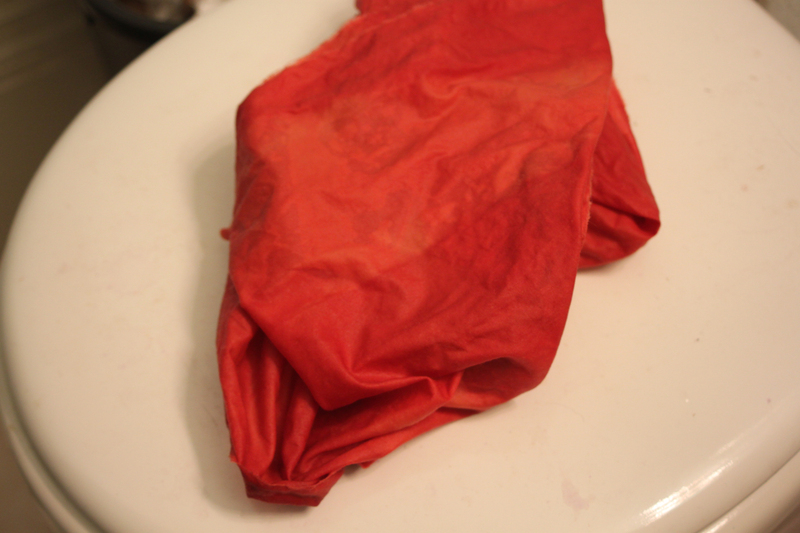 I don’t know if it was because the wool held more of the mordant bath than the single piece of cotton, but the cotton wrap is actually pretty darned red. The wool was a brown that B had brought along, and took the dye nicely, resulting in a rich brick red. You can see the single-mordanted cotton sample in the bottom right corner. 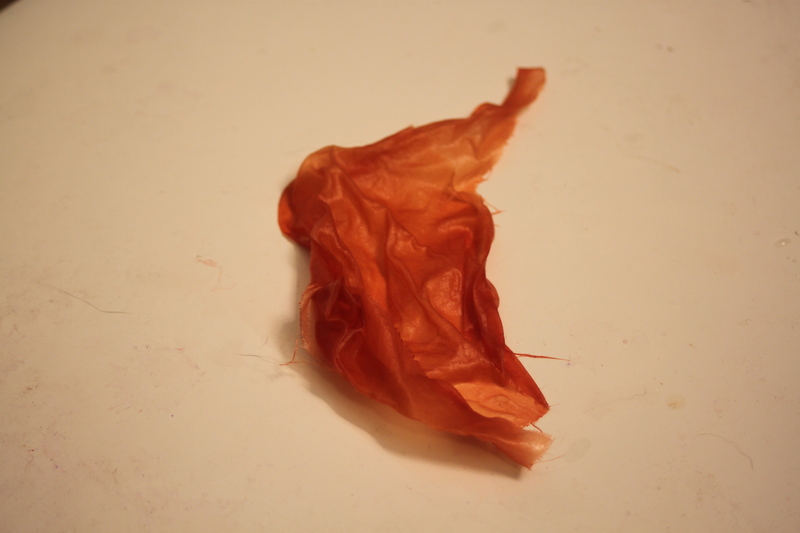 It’s a nice pale shade of red-orange, sort of a pale coral. Not bad, but still, not what I was hoping for. A deeper red, but not a terribly even color. Still, not totally disappointing. 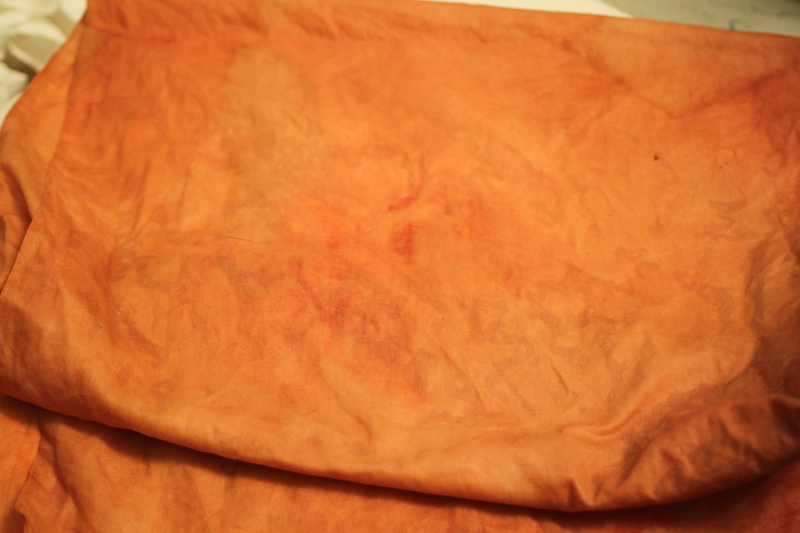 As with the others, much browner than I’d hoped, but that could be because I wasn’t getting a good temperature reading, and the dye bath might have gotten too hot; overheating saddens the color (makes it more brown). I mean, look at that red! Holy crap! It is ridiculous! I am flabbergasted. Clearly I’m on the right track. It’s a little pinker than red, but it’s still pretty brilliant. 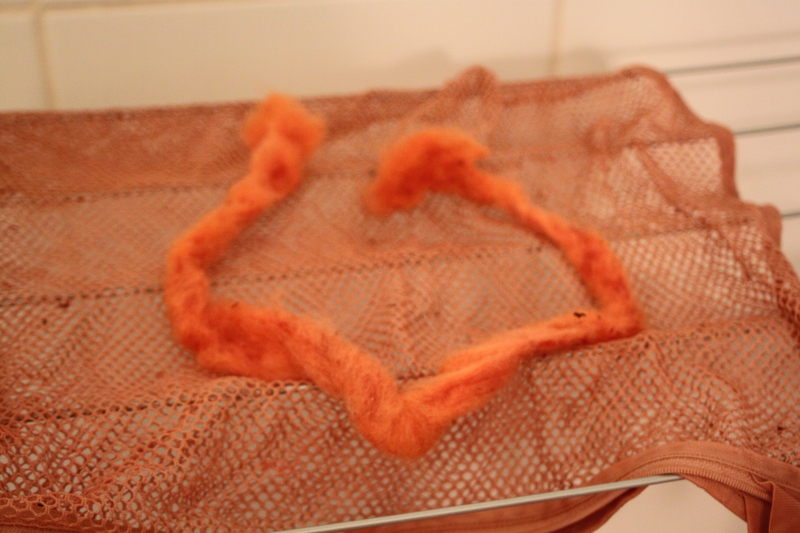 All of these were taken after I rinsed out the excess dye and soaked the fibers in a vinegar and salt bath. Now the big challenge is to figure out how I can get the same richness of color with a stamp. The trick to a deep, rich color seems to be the extended soaking period, although I’m tempted to take the dye liquid from the successful jar test and print with it, to see if maybe that gives me similar results. 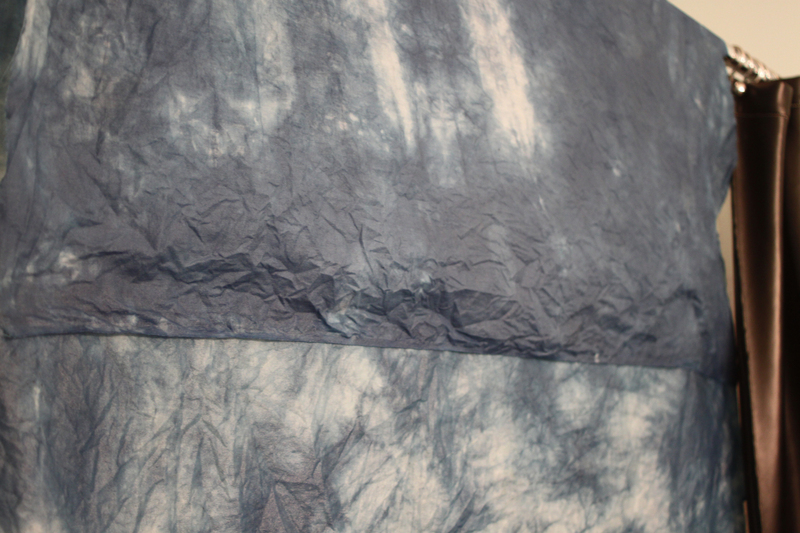 This entry was posted in crafts, dyeing, sca and tagged crafts, dyeing, fabric, india, madder, natural dyes, sca. Bookmark the permalink. 2 Responses to Dye all the things! 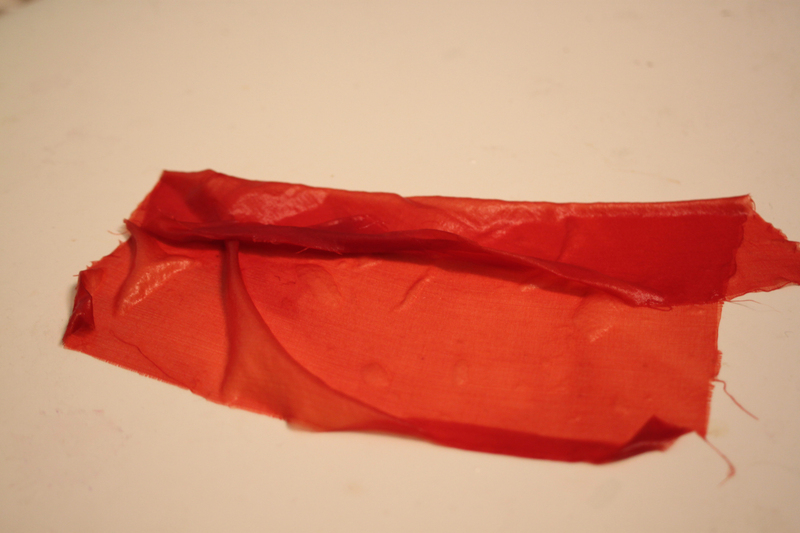 Wow that silk came out beautiful! 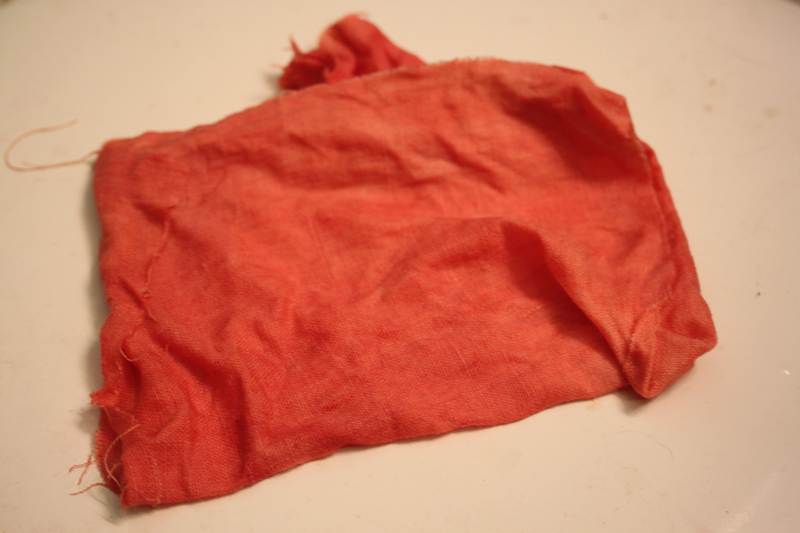 And the linen not so bad…I think you have it we have to be patient to get the really red color. It has so faded. I forgot that things are darker when they’re dry. Oh, well! Still, I think we’re on to something.